So the next free floral I received was the Lots of Lavender stamp set. I just love these delicate floral. 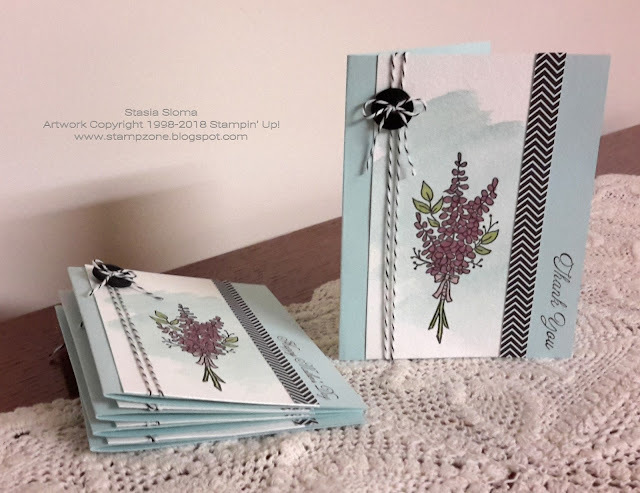 The set comes with a two step stamping image that does not require you to color it in petal by petal, but I had my Stampin' Blends out and I had more fun coloring in the image. Coloring is very therapeutic for me. First I did the watercolor background with my Aqua Painter and Soft Sky ink refill. Next came the stamped image and coloring. The sentiment comes from the Heartfelt Blooms stamp set and the designer series paper is from the retired Pop of Pink designer series paper. Less than a month to Sale-a-brate, don't hesitate to earn you free beautiful sets.